BEDFORD-STUYVESANT – Fashion Week Brooklyn (FWBK)’s F/W 2019 Collections designer showcase was a sartorial mix of high and low fashion for the season. Five brands took the runway on Friday night at the 630 Flushing Avenue event space to regale fashion enthusiasts with their diverse and inclusive display. 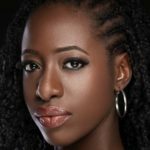 FWBK’s aim with every event is “showcasing the diversity of talent, spaces, art, and fashion,” according to their website. The first main night of designer collections rung true to their aim. Catherine Schuller’s Runway the Real Way (RTRW), was more of a show within the show than an actual clothing brand. 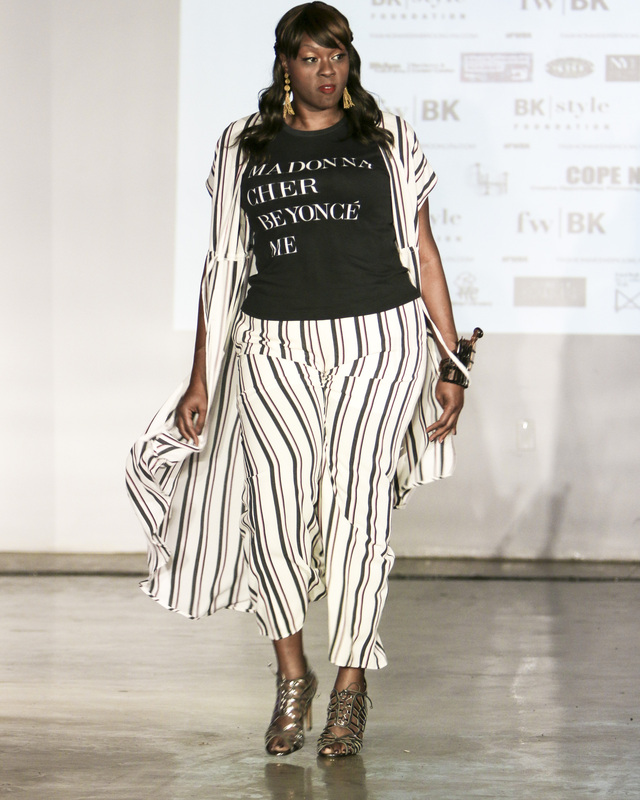 RTRW, whose mission is to promote diversity on the runway with the inclusion of plus-size and other marginalized models, can be applauded for the range of beautiful models they produced. Their collection, on the other hand, was inconsistent with seasons, color palettes, silhouettes, and an overall aesthetic being difficult to pinpoint. 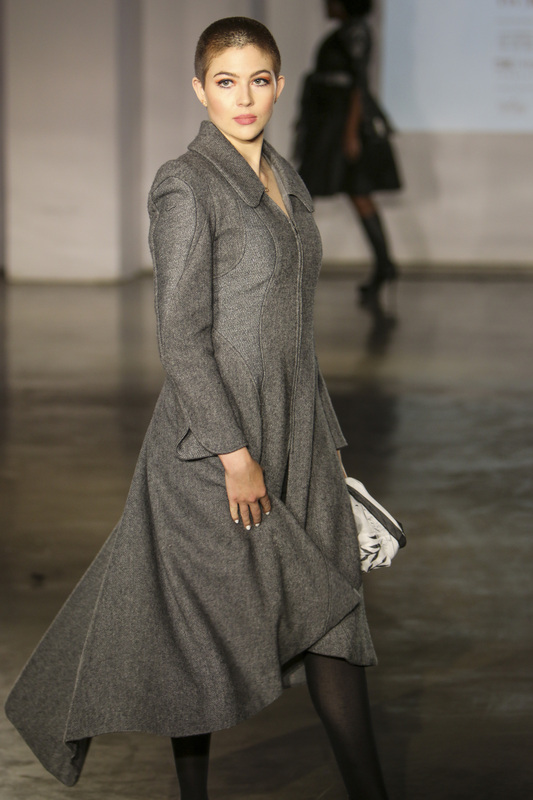 The men wore leather trench coats and jackets, while the women moved between spring pieces and fall looks. Blondes. Babes. Bahamas. Those may be the best words to encapsulate the following brand, Coketta Beachwear. The handmade crochet dresses, shorts, cover-ups, and bikini pieces in predominantly black, tan and white was beautiful, aesthetically pleasing, and safe. The multi-colored diamond designed crochet poncho proved to be the main piece of the collection that gave a distinct personality to the brand. FWBK’s debut designer Kramronuj by Mark was all personality. The young Guyanese designer previously showed a version of this collection, “She Killed Death,” in Suriname Fashion Week last October. On his first showcase in Brooklyn, he chose to expand on it drawing inspiration from the women in his life. 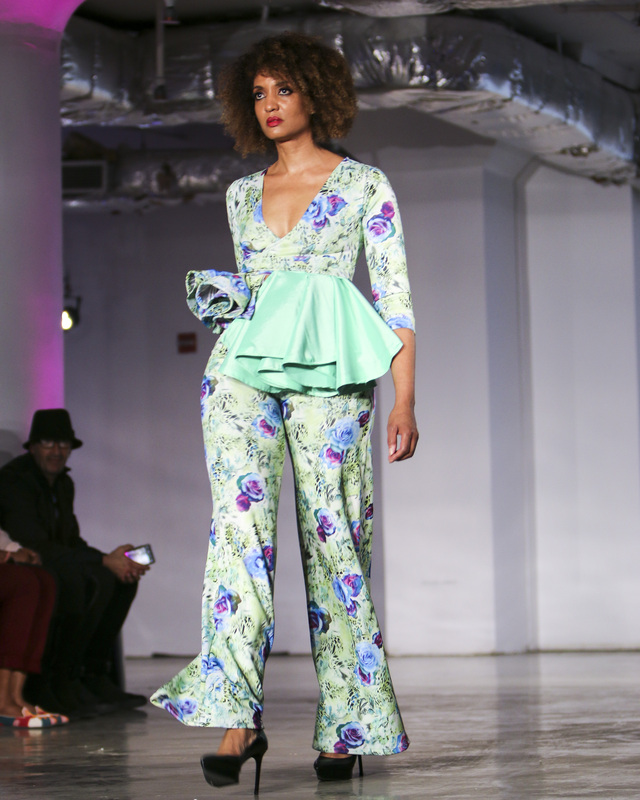 The collection’s mint green print floral spandex and satin gowns and skirts brought a softness to the showcase. His use of black sequined tulle as an accent to a few of the dresses showed the designer’s ability to take bold chances without diluting the femininity of the collection, which was filled with ruffles and flowing wide sleeves. Feminist commentary has oversaturated runways in the past few years with the rise and anger of the #MeToo movement. Hood Goodie brought a somewhat fresh-ish take on this with a fun, entertaining, and upbeat collection that speaks the Brooklyn language. The overuse of the word “empowering” to describe female-centric t-shirts shall not be used here. But Kali, the brand’s designer, was clearly sending a message. This collection drew inspiration from the 90s, pop, and Gianni Versace. “Not Versace, but Gianni Versace,” Kali said after the show. The women’s streetwear brand’s F/W 2019 collection included sweatsuits, bodysuits, pull-overs and jumpsuits in a pastel purple and pink color palette with words such as “dope girls hustle pretty” and “gangsta as f***” sprawled everywhere. Designer Annina King of Granaté was the reason to stay till the end of this showcase. Her collection surpassed the others without a second thought. King’s well-tailored clothing breathed life into the show, reminding everyone what it means to love the artistry of fashion. Her use of sharp and innovative lines in every piece demonstrated the designer’s ability to maneuver fabric as building blocks. The long coats in blacks and grays, with their nipped waist, shorter front hem and flowing backs, had a McQueen-esque feel but with a strong story of its own. The designer’s use of natural fabrics in wool and cotton, adding embroidered floral lace to jacket handles or delicately on sheath dresses, reflected her love for nature. “I’m inspired by nature because the creator of nature is the ultimate designer,” King said. Impeccably structured and carefully styled, like curated pieces of an art gallery, Granaté closed the evening off with a desire for more.